Multiple full episodes of car cartoons forchildrenin a single 10 minutes long video, watch it online for free! Watch cartoons for children about the funny cars non-stop! 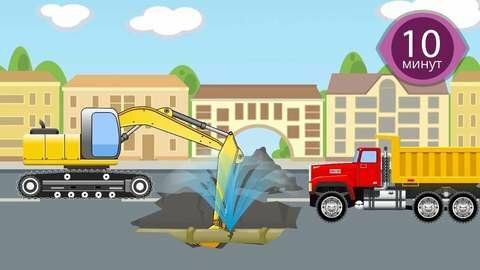 While digging a hollow on the road, Excavator accidentally damages a water pipe. It starts leaking and very soon the whole city is flooded! Cars sink, garbage is all over. Luckily, robots can fix the damage quickly, and then Excavator uses its bucket to push water from the roads into river.